Earth, our home, is the third planet from the sun. It's the only planet known to have an atmosphere containing free oxygen, oceans of water on its surface and, of course, life. Earth is the fifth largest of the planets in the solar system. It's smaller than the four gas giants —Jupiter, Saturn, Uranus and Neptune — but larger than the three other rocky planets, Mercury, Mars and Venus. 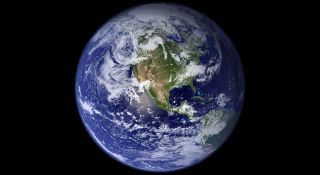 Earth has a diameter of roughly 8,000 miles (13,000 kilometers) and is round because gravity pulls matter into a ball. But, it's not perfectly round. Earth is really an "oblate spheroid," because its spin causes it to be squashed at its poles and swollen at the equator. Water covers roughly 71 percent of Earth's surface, and most of that is in the oceans. About a fifth of Earth's atmosphere consists of oxygen, produced by plants. While scientists have been studying our planet for centuries, much has been learned in recent decades by studying pictures of Earth from space. While Earth orbits the sun, the planet is simultaneously spinning on an imaginary line called an axis that runs from the North Pole to the South Pole. It takes Earth 23.934 hours to complete a rotation on its axis and 365.26 days to complete an orbit around the sun. Earth's axis of rotation is tilted in relation to the ecliptic plane, an imaginary surface through the planet's orbit around the sun. This means the Northern and Southern hemispheres will sometimes point toward or away from the sun depending on the time of year, and this changes the amount of light the hemispheres receive, resulting in the seasons. Earth's orbit is not a perfect circle, but rather an oval-shaped ellipse, similar to the orbits of all the other planets. Our planet is a bit closer to the sun in early January and farther away in July, although this variation has a much smaller effect than the heating and cooling caused by the tilt of Earth's axis. Earth happens to lie within the so-called "Goldilocks zone" around the sun, where temperatures are just right to maintain liquid water on our planet's surface. Scientists think Earth was formed at roughly the same time as the sun and other planets some 4.6 billion years ago, when the solar system coalesced from a giant, rotating cloud of gas and dust known as the solar nebula. As the nebula collapsed because of its gravity, it spun faster and flattened into a disk. Most of the material was pulled toward the center to form the sun. Other particles within the disk collided and stuck together to form ever-larger bodies, including Earth. Scientists think Earth started off as a waterless mass of rock. "It was thought that because of these asteroids and comets flying around colliding with Earth, conditions on early Earth may have been hellish," Simone Marchi, a planetary scientist at the Southwest Research Institute in Boulder, Colorado, previously told Space.com. But in recent years, new analyses of minerals trapped within ancient microscopic crystals suggests that there was liquid water already present on Earth during its first 500 million years, Marchi said. Radioactive materials in the rock and increasing pressure deep within the Earth generated enough heat to melt the planet's interior, causing some chemicals to rise to the surface and form water, while others became the gases of the atmosphere. Recent evidence suggests that Earth's crust and oceans may have formed within about 200 million years after the planet took shape. Earth's core is about 4,400 miles (7,100 km) wide, slightly larger than half the Earth's diameter and about the same size as Mars' diameter. The outermost 1,400 miles (2,250 km) of the core are liquid, while the inner core is solid; it's about four-fifths as big as Earth's moon, at some 1,600 miles (2,600 km) in diameter. The core is responsible for the planet's magnetic field, which helps to deflect harmful charged particles shot from the sun. Above the core is Earth's mantle, which is about 1,800 miles (2,900 km) thick. The mantle is not completely stiff but can flow slowly. Earth's crust floats on the mantle much as a piece of wood floats on water. The slow motion of rock in the mantle shuffles continents around and causes earthquakes, volcanoes and the formation of mountain ranges. Above the mantle, Earth has two kinds of crust. The dry land of the continents consists mostly of granite and other light silicate minerals, while the ocean floors are made up mostly of a dark, dense volcanic rock called basalt. Continental crust averages some 25 miles (40 km) thick, although it can be thinner or thicker in some areas. Oceanic crust is usually only about 5 miles (8 km) thick. Water fills in low areas of the basalt crust to form the world's oceans. Earth gets warmer toward its core. At the bottom of the continental crust, temperatures reach about 1,800 degrees Fahrenheit (1,000 degrees Celsius), increasing about 3 degrees F per mile (1 degree C per km) below the crust. Geologists think the temperature of Earth's outer core is about 6,700 to 7,800 degrees F (3,700 to 4,300 degrees C) and that the inner core may reach 12,600 degrees F (7,000 degrees C) — hotter than the surface of the sun. Earth's magnetic field is generated by currents flowing in Earth's outer core. The magnetic poles are always on the move, with the magnetic North Pole accelerating its northward motion to 24 miles (40 km) annually since tracking began in the 1830s. It will likely exit North America and reach Siberia in a matter of decades. Earth's magnetic field is changing in other ways, too. Globally, the magnetic field has weakened 10 percent since the 19th century, according to NASA. These changes are mild compared to what Earth's magnetic field has done in the past. A few times every million years or so, the field completely flips, with the North and the South poles swapping places. The magnetic field can take anywhere from 100 to 3,000 years to complete the flip. The strength of Earth's magnetic field decreased by about 90 percent when a field reversal occurred in ancient past, according to Andrew Roberts, a professor at the Australian National University. The drop makes the planet more vulnerable to solar storms and radiation, which can could significantly damage satellites and communication and electrical infrastructure. "Hopefully, such an event is a long way in the future and we can develop future technologies to avoid huge damage," Roberts said in a statement. When charged particles from the sun get trapped in Earth's magnetic field, they smash into air molecules above the magnetic poles, causing them to glow. This phenomenon is known as the aurorae, the northern and southern lights. Earth's atmosphere is roughly 78 percent nitrogen and 21 percent oxygen, with trace amounts of water, argon, carbon dioxide and other gases. Nowhere else in the solar system is there an atmosphere loaded with free oxygen, which is vital to one of the other unique features of Earth: life. Air surrounds Earth and becomes thinner farther from the surface. Roughly 100 miles (160 km) above Earth, the air is so thin that satellites can zip through the atmosphere with little resistance. Still, traces of atmosphere can be found as high as 370 miles (600 km) above the planet's surface. The lowest layer of the atmosphere is known as the troposphere, which is constantly in motion and why we have weather. Sunlight heats the planet's surface, causing warm air to rise into the troposphere. This air expands and cools as air pressure decreases, and because this cool air is denser than its surroundings, it then sinks and gets warmed by the Earth again. Above the troposphere, some 30 miles (48 km) above the Earth's surface, is the stratosphere. The still air of the stratosphere contains the ozone layer, which was created when ultraviolet light caused trios of oxygen atoms to bind together into ozone molecules. Ozone prevents most of the sun's harmful ultraviolet radiation from reaching Earth's surface, where it can damage and mutate life. Water vapor, carbon dioxide and other gases in the atmosphere trap heat from the sun, warming Earth. Without this so-called "greenhouse effect," Earth would probably be too cold for life to exist, although a runaway greenhouse effect led to the hellish conditions now seen on Venus. Earth-orbiting satellites have shown that the upper atmosphere actually expands during the day and contracts at night due to heating and cooling. Oxygen is the most abundant element in rocks in Earth's crust, composing roughly 47 percent of the weight of all rock. The second most abundant element is silicon, at 27 percent, followed by aluminum, at 8 percent; iron, at 5 percent; calcium, at 4 percent; and sodium, potassium and magnesium, at about 2 percent each. Earth's moon is 2,159 miles (3,474 km) wide, about one-fourth of Earth's diameter. Our planet has one moon, while Mercury and Venus have none and all the other planets in our solar system have two or more. The leading explanation for how Earth's moon formed is that a giant impact knocked the raw ingredients for the moon off the primitive, molten Earth and into orbit. Scientists have suggested that the object that hit the planet had roughly 10 percent the mass of Earth, about the size of Mars. Earth is the only planet in the universe known to possess life. The planet boasts several million species of life, living in habitats ranging from the bottom of the deepest ocean to a few miles into the atmosphere. And scientists think far more species remain to be discovered. Researchers suspect that other candidates for hosting life in our solar system — such as Saturn's moon Titan or Jupiter's moon Europa — could house primitive living creatures. Scientists have yet to precisely nail down exactly how our primitive ancestors first showed up on Earth. One solution suggests that life first evolved on the nearby planet Mars, once a habitable planet, then traveled to Earth on meteorites hurled from the Red Planet by impacts from other space rocks. "It's lucky that we ended up here, nevertheless, as certainly Earth has been the better of the two planets for sustaining life," biochemist Steven Benner, of the Westheimer Institute for Science and Technology in Florida, told Space.com. "If our hypothetical Martian ancestors had remained on Mars, there might not have been a story to tell." What Is the Temperature on Earth? This story was updated on Oct. 10, 2018 by Space.com Contributor, Nola Taylor Redd.